Peat Monster (46.0%): I never quite understood people watching a magic show and constantly trying to figure out how the illusion works on stage and to reveal the secrets: "I bet there are strings attached to the girl! ", "Did you see the mirror behind the box?" or "If I watch it again I will definitely catch what he is doing between those two scenes." What is the point? Just chill... Relax and enjoy the show, enjoy the illusion, that's the whole point. I think John Glaser is one of the greatest performers of the contemporary whisky world, a magician so to speak and he creates non-stop magic potions for us. But sometimes I feel like people are more interested in how and what he blends instead of the whisky he puts in the bottle at the end. What difference does it make? Are you planning to decipher the secret recipe and blend it at home? Could you paint like Gerhard Richter if he gave you all his paints and additives he used? Or could you write another 7th Symphony? We know all the notes Beethoven used to write it... I personally don't care too much whether the recipe has Laphroaig or Ledaig, Ardmore or Clynelish... I am more interested in what Glaser comes up with them. 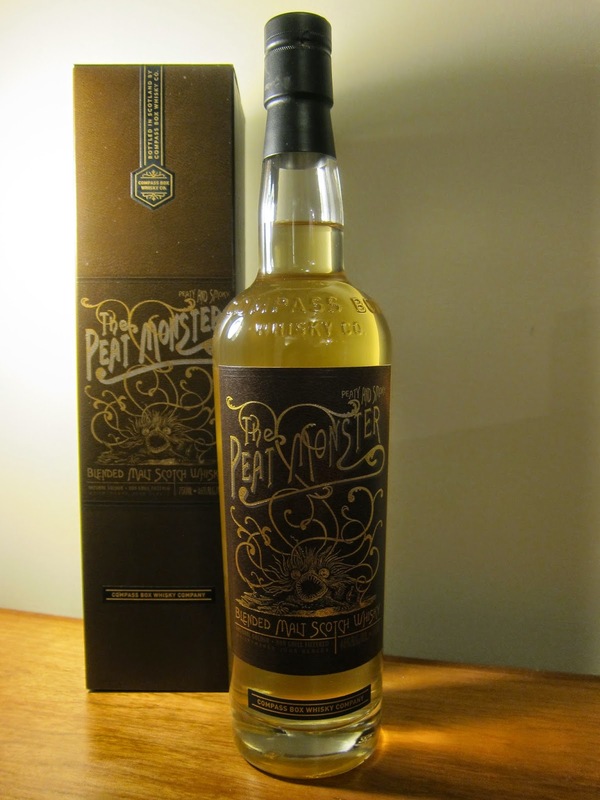 And today I have a wee sample of the latest Peat Monster release I cannot wait to pour some in my glass. All the malts in the blend are aged in refill American oak casks and not chill-filtered. Color: Lemon chiffon, straw. Actually as pale as a whisky gets I think. Nose: Rubber garden hose, freshly laid warm asphalt and nylon shopping bags. Sea salt, wet black soil after a heavy summer rain and eucalyptus drops. Sweet, damp and green peat mixed with sea breeze. A few drops of water added tons of strawberries (I didn't see that one coming) with spearmint, green tobacco leaves and also samphire. Palate: Sea salt covering the mouth... Capers, dry-salt cured green olives and cigarette ash. Copper pennies and guava. Water takes out some from the texture. But it is definitely less salty but incredibly easy going and actually sweeter and creamier right now. Finish: Gets very vegetal at the finish: Bitter greens, dandelion greens and Belgian endives. It fades out with white pepper and mint leaves. Overall: I always enjoyed how Peat Monster changes slightly with every edition and this one is not an exception. I like the way Glaser is trying to give the best balance with the available casks instead of trying to keep the expression consistent. I personally preferred this one without adding water. By the way this sample was saved from one of the bottles we tasted a little more than a week ago as a part of our peaty whiskies tasting put together by me and Dave Russo and hosted by Onur Sergici. You can check out the line-up below... It was a tasty evening needless to say and I will be posting occasionally tasting notes from that night when I have time. Slainte..!